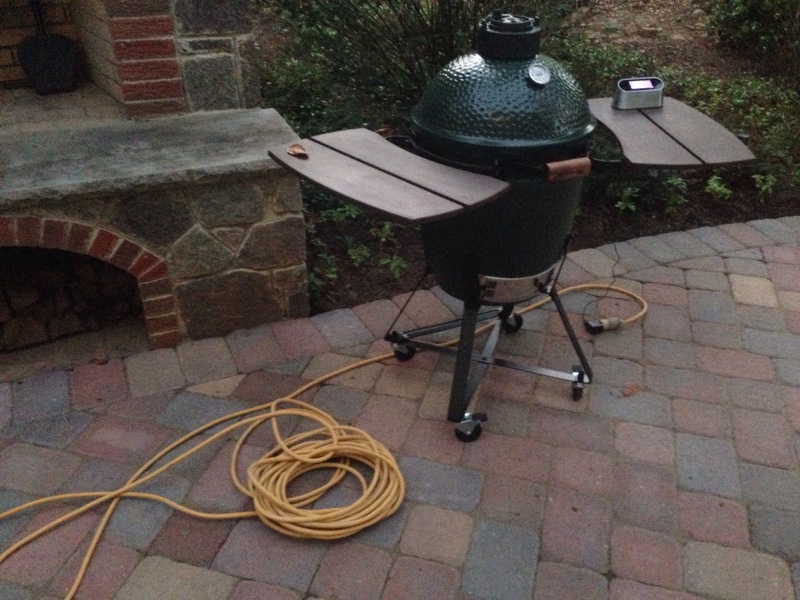 We recently got a Big Green Egg ceramic charcoal cooker at the RatRanch. I have nothing but praise for the BGE. It lights fast, cooks evenly and consumes a surprisingly small amount of charcoal. In preparation for cooking a big pork shoulder, I picked up the new Williams-Sonoma “Smart Thermometer” so I could monitor the temperature of the meat, which needs to cook at 225° for several hours. 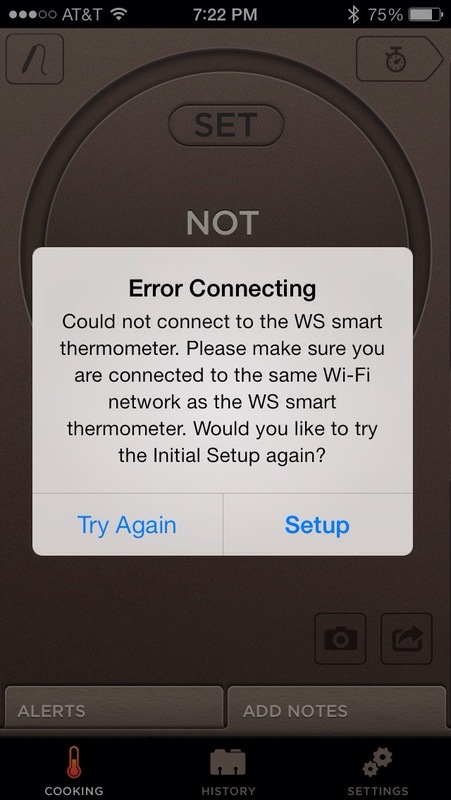 I happened to be at a Williams-Sonoma store on the day they got their first stock of Smart Thermometers. Perhaps I should have been suspicious when the sales clerk offered to print a receipt for me instead of emailing it like they usually do? The best feature of the Smart Thermometer is its packaging, which is thoughtfully designed. It deboxes a lot like an Apple product. The thermometer itself is crafted from stainless steel and feels heavy and solid. However, the included charger and cord are flimsy and feel like they wouldn’t last for long. Fortunately, it accepts a standard mini-USB cable. So I charged up the thermometer and hit the power button. Nothing. Nada. Dead on arrival. So back to Williams-Sonoma I went. When I said that I got a defective unit, I was pointed to the retail display and told to grab another one If I wanted. No paperwork. Were they exchanging a lot of these? I headed back home and charged up thermometer #2. This one turned on and I went through a clumsy setup routine to pair it with my iPhone so I could use the remote monitoring app. I turned off the thermometer, which appeared to be ready for my big pork cookery the next day, and left it charging overnight. In the morning I fired up the Egg and put my pork shoulder in. Hooked up the thermometer and turned it on. But the iPhone app no longer recognized the thermometer. Since the pork was already cooking and I didn’t want to open the Egg, I continued cooking it without the app, periodically running outside in the cold to check the temperature display. Yes, that’s an extension cord. Adding insult to injury, the battery died five hours into the cook! I found that the only way to make the remote monitoring app work was to repeat the cumbersome setup process every time the thermometer was turned on. I tried calling tech support, where a courteous but untrained rep couldn’t solve the problem either. According to several reviews posted to the Williams-Sonoma website, others have had similar results. So back to the store went thermometer #2, for a refund this time. A week later my friend attended an in-store cooking class, where they demonstrated the Smart Thermometer. It didn’t work. BTW, I ended up ordering a Maverick remote read wireless thermometer from Amazon for $60, which I’m satisfied with. It doesn’t look as elegant as the WS thermometer and it doesn’t connect to my iDevices, but it’s cheap and it works. Plus, this thermometer comes with two probes, so you can remotely monitor both the food and grill temperatures. This entry was posted in Apple, Cooking, Food, Rants, Reviews and tagged Big Green Egg, Thermometer, Williams-Sonoma on November 26, 2013 by ratranch.